I was wondering how do you know where the largest files in my system are stored. Disk Space Used: 1GB Java: 500MB Java Percentage: 50% maybe represented in a pie chart. Maybe? I know this maybe a feature overkill. I sometimes forget having stored things and wonder why my disk is so full. So basically a command that will allow me to run on the file system and provide me with information on disk space used. The documentation on it is a little sparse, but you can find more information on the Ubuntu wiki, and the project page. If you're interested in using the command line, there's du which is described here. Unless it changed recently, baobab only shows directories; check out kdirstat for an alternative that actually shows files, coloured by type. The solution that @UncleZeiv proposed is not working when there is really no more space left, since sort is using the /tmp folder when there are multiple lines to sort. 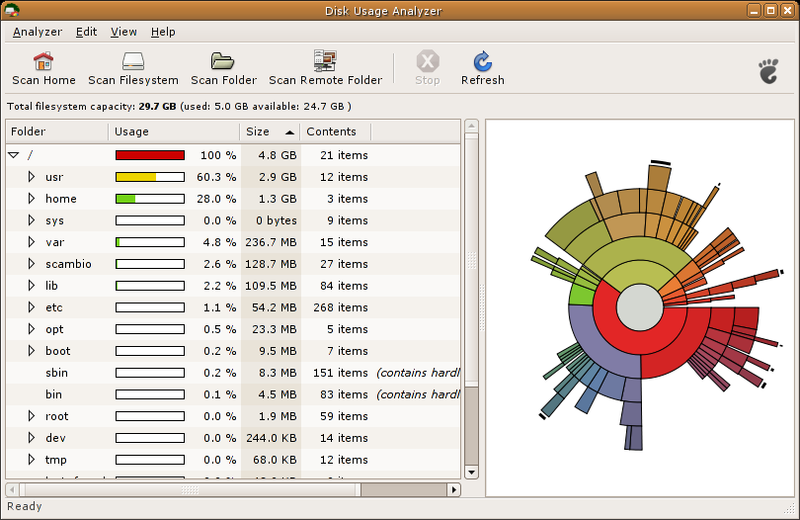 The other excellent pie-graph disk usage tool is Filelight. It's a KDE app, and it's available in the repositories. Not the answer you're looking for? Browse other questions tagged filesystem disk memory command-line or ask your own question. What is `sudo apt-get clean`? root partition disk is full, how to clear it? How do I determine the total size of a directory (folder) from the command line? Where are decrypted files stored during runtime? Where are the default Unity lenses stored? Where are application files stored? Where are SMS and MMS stored? Where are file properties stored on the actual file system? How to list files from n biggest directories? where are commands actually stored in linux?